This is what I wore last Saturday to our family lunch, which we arrived at at past 2. Pardon the wet hair and the squinty eyes, trying to mask a hangover and constipation. Too much information? I hate it when I get constipated after a night of drinking. Don't you just want to get rid of all of those toxins first thing the next day? When my digestive system fails, my day is ruined. Must make a mental note to stock up on C-lium. Excellent colour combination, looks good with your hair style. Like it a lot. That's my favorite Bruce Lee film! And you're totally rocking that top. Do more of these inspiration looks! I think I wouldn't have made the connection if I didn't see the photo of Bruce Lee...I still say you look great Sarah. And I in case I haven't said already, I looooooooove the hair. 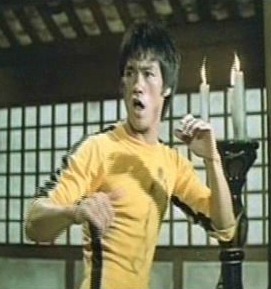 You make a great bruce lee. Love the honesty. If its TMI for someone they don't need to read it.